Melissa Terrill is our guest blogger, taking on a topic that often fills so many of us with anxiety. Melissa and her husband lost their daughter nearly 9 months ago after she was born at the tender age of 24 weeks. Melissa is a dear friend of ours and of Half-Pint Resale, and offered to write this post to give us all the tools – the words – the permission some of us may feel we need – to be there for our friends and family who are going through such a tragedy. She speaks with compassionate but straightforward truth, and we encourage you all to read and to share this important information, so that we can be community and family for one another. Melissa and Mike and their son Jonathan have also begun a truly wonderful non-profit in honor of their daughter, called Mikayla’s Grace, which seeks to support families with a baby in the NICU and those who experience the death of an infant at Madison area hospitals. The non-profit provides provides NICU care packages and angel memory boxes, offering both practical and emotional support for the parents. There are many ways you can get involved – read on. According to 2004 statistics issued by the CDC 15.6% of pregnancies in the United States ended in either a miscarriage or stillbirth. Which means that most of us have either been directly affected or know someone who has been affected by the loss of an infant. My family has experienced this heartache first hand, when our second child Mikayla Grace was born prematurely for unknown reasons at only 24 weeks and 5 days last June. In one day, our dreams as we knew them came crashing down, when we learned that our daughter would not survive after being alive for only 36 hours. You can read more of our story here. The world suddenly became a very lonely place, one in which our “new normal” was so unexpected that even those closest to us were at a loss of what to do. I have learned a great deal through this experience, and I hope that I can share a few things that might help you if someone in your life experiences the death of their child. It is hard to know what to say to a grieving parent, and I’m almost certain that before Mikayla died I wouldn’t have had a clue either. Our own fear of loss can render us immobile. One of the most difficult things that a bereaved parent deals with is when people say nothing about the the child that is on their minds every moment of the day. I remember thinking that it seemed like others had returned to their lives so quickly, leaving us to deal with our grief on our own in many ways. Bereaved parents need your loving support more than ever. Please do not stay away or ignore the loss. Not speaking about it does not lessen its reality. Bring up the subject, and be prepared for tears. Nothing you say will ever make the bereaved parent sadder than the reality of losing a child. Simply allowing a safe space for them to grieve without denying that grief is all that’s required of you. Remember, it is usually the simple things you say or do that mean so much. It is important to remember, as a friend or family of bereaved parents, that the parents only grieve because they loved so deeply. 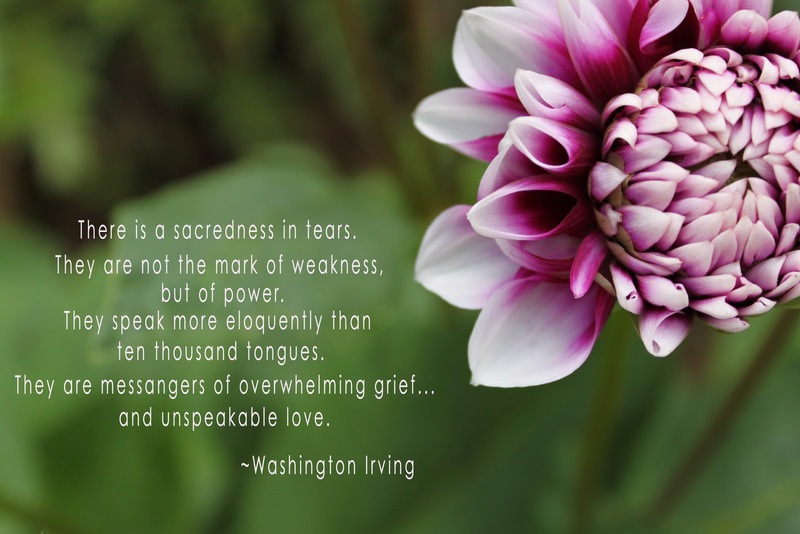 Their tears speak this unspeakable love, do not be afraid of their tears. Do not be afraid to speak the name of the baby that they still love even though the baby is no longer with us. 1. The most important thing to ANY bereaved mom is to know that you remember and care about her baby. Contrary to the widespread notion that “getting over” loss depends on “letting go” of the person who died, many people find that successfully going on with their lives includes finding a new way to feel connected to the person who died. When I found this on the Sweet Dreams Our Angels website I really connected with it. I knew that I wanted Mikayla to have a legacy that would carry on to help other families that have also experienced the loss of a child, and that is why I started our non-profit, Mikayla’s Grace. Mikayla’s Grace is an organization that we formed to support families with a baby in the NICU and those who experience the death of an infant at Madison Area hospitals by providing NICU care packages and angel memory boxes that offer both practical and emotional support for the parents. We received a lot of support from the nurses while we were in the hospital with Mikayla, but the hospital has a limited budget for bereavement materials and does not currently have a consistent supplier of donations for things to be used to make memories of the baby’s life for bereaved parents. We strive to improve the quality of this experience for parents in this situation. We will be making our first donation of Angel Memory Boxes to the NICU at St. Mary’s Hospital where Mikayla was born. Our first donation of these boxes will be in June 2011, in memory of Mikayla’s first birthday, and we are working on the donation of the NICU Care Packages for later this year. Visit our website to find out how you can help or “like” our facebook page. We are currently running a Flower Fundraiser until April 29th to buy needed items for the boxes. You can purchase flower bulbs to plant in your garden and 50% of your purchase will go directly to Mikayla’s Grace. We are also looking for volunteers who can knit, crochet, or sew. We are hoping that we can gain enough support so that after our first donation in June this can be an ongoing project for many years to come. Please consider visiting our website to help out and pass this information along to anyone you think might be willing to help! We need all the help we can get to make sure that this non-profit can continue supporting NICU babies and bereaved parents in our community. The Bereaved Parents of Madison Infant Loss group meets on the third Thursday of each month at 7:30 pm, in Bay 4 of St. Mary’s hospital. Their website is http://bereavedparents.squarespace.com/. They also have a facebook group that is just for members and is a helpful way to connect to other bereaved parents. SHARE meets the fourth Wednesday of each month at 6:30 pm. Location varies so email Cynthia for monthly location. You can also check out Cythia’s blog, where she discussed the topic of “What you can say” to bereaved parentsIf you have a friend or family member that experiences infant loss, encourage them to attend a group even if they are hesitant. Connecting with other bereaved parents has helped my husband and I tremendously along our healing journey, and we are amazed at the support we’ve received from these other parents. There are also many online resources and places where parents who’ve experienced a loss can connect with other bereaved parents. Babycenter.com has support groups and Faces of Loss, Faces of Hope has the most comprehensive list of resources for parents and family members and is also a place where parents can share their child’s story. This site has a very good explanation of grief if you’d like to understand a little better what bereaved parents face. If you would like to get something for a bereaved parent but not sure what to do this article gives good ideas for appropriate sympathy gifts. I also have a post on my personal blog about What Parents of Angels Wish You’d Remember written in hopes that people would begin to understand what I, as a bereaved parent, needed. Another fellow blogger, Carly Marie, has written articles on How You Can Help Ease the Pain and How Friends and Family Can Help that are worth reading. Keep in mind that although most parents will grieve differently, most bereaved parents would appreciate you doing something. The only wrong thing to do is nothing. I hope that by sharing my story it will help others that are going through this journey as well.